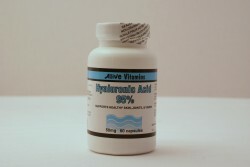 Alive Brand of Hyaluronic Acid now in the flyer until January 31st 2010! Now only $43.99! Buy 6 and get 1 FREE! Good for you eyes, skin, joints and more! Hyaluronic Acid (HA) is produced naturally in our body, but as we age our body produces less and less. The reason HA is so vital, is it keeps the moisture in our skin. It also protects our joints while boosting our level of collagen. Remember collagen is the main protein of connective tissue. It is in our muscle, skin, and throughout the entire body. It is a major component of what holds us together. As mentioned, HA are natural molecules produced in our body and when we are young we produce around three grams daily. As we age and loose the ability to produce this wonderful molecule that ultimately keeps us strong throughout our body. It is recommended to take 200mg of HA daily. Banishing wrinkles is possible by taking HA internally. Taking HA for three to four months boosts collagen production dramatically. Our customers have noticed firmer skin, smoother skin, improved complexion as well as more youthful looking skin. HA works by acting like a sponge holding up to 1000 times its own weight in moisture. This is what helps to plump the skin and literally erase fine lines and wrinkles. Speed the healing of injuries and prevent scarring with HA. It has been shown that HA not only speeds the healing of wounds, but it also will slowly get rid of old scarring. This is especially helpful for people who suffer or who have suffered from acne in the past and now are dealing with the scars and an uneven complexion. Leading researchers have found that taking just 140mg of HA a day shortens the time it takes a wound to heal by 40%! Remember, while HA is a wonderful find, try not to be impatient. For example, it takes on average three months to get rid of old acne scars. Hang in there it is worth the wait. Alice Chung, the owner of Alive Health Centre, has been using HA for years now and everyday people are amazed that she is 62 years old with baby soft skin. Once customers find out her age they furrow their eyebrows and move up closer wanting to see if there is botox or some sort of cosmetic surgery, and they are always amazed that its all natural! Ease your joint pain with HA. For those who are not sure about HA, the FDA approves injections of HA right into joints that are suffering from arthritis. Patients find relief because the HA acts like a sponge and absorbs shock. There has been tremendous success for those that have been taking 200mg a day of HA. The dosage has allowed people to naturally rebuild the pockets of fluid between their joints. They are finding that HA is also actually helping to rebuild the cartilage in the joint. Also the beauty of HA is that the capsule is tiny! Anyone can seriously manage to swallow this. Protect your eyes with HA. Doctors use HA to speed the healing of eye surgery. However, you can take a maintenance dosage to prevent macular degeneration, which is the number one cause of blindness in adults. Taking HA reduces the risk of developing a detached retina. HA is becoming more and more well known. Alive has been selling HA a long time before the hype. We have had customers come in a use it for their joints or skin and this one women came back into the store to let us know that we forgot to mention that it helped with the eyes and that she is noticing a huge improvement! She was estatic that her macular degeneration was not progressing anymore. As always we are happy to help you with your health. We look forward to seeing you at Alive Health Centre, Supplements Plus and Morning Sun! Hope you have a great rest of your week. Guest on the Beat 94.5 Kid Carson Show: Dr Tasreen Alibhai, N.D. I have found joint pain relief by taking HA and adding pure collagen to it.